Paeonia Alertie is a fragrant peony that blooms early in peony season. 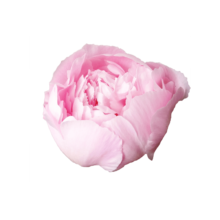 Its flowers have a light pink colour which gives this peony an energetic and frivolous look. Springtime in a vase! Paeonia Alertie is a double-flowered peony with flowers that open up in the shape of a ball. The buds are not very impressive looking, but its during blooming when this peony will start showing its muscles. It only takes a very short time for those boring buds to transform into beautiful flowers. Alertie is a sibling of peony varieties Pecher and Noemi Demay. All three varieties have a lot in common, but differ in terms of the number of stems per plant and the length of those stems. Alertie has the longest stems of all three peonies. In contrast to its siblings however, very little is known about the history of Alertie. Alertie blooms early in season with tremendous force. If you can sweep away the bracts with your thumb, the peony has reached the right stage of maturity. Don’t wait any longer to cut it, because it’ll start blooming before you know it!